Nowadays, it isn't a really big news in Singapore that the chefs who had been worked at some world's best restaurants opened their own restaurants. While the Fat Duck’s ex-development chef, Ivan Brehm definitely counted to one of the earliest famous chefs in Singapore. Now with the Australian-borned chef de cuisine Mark Ebbels who was trained under Heston Blumenthal, a new stage of Bacchanalia was opened on Hong Kong street - The Kitchen at Bacchanalia. Another main reason made me interested in Bacchanalia is because of Chef Namae-san of 2* L'effervescence in Tokyo, the chef-owner of one of my top French restaurant so far, who was too trained at Fat Duck with Chef Ivan of Bacchanalia. Name-san had came to Singapore several times for collaborations between L'effervescence and Bacchanalia. Bacchanalia features a open kitchen where you can see the chefs work in front of you. The decor of the restaurant is modern, woody and relax. Unlike upscale fine dining restaurants, Bacchanalia is more like a casual fine dining place that won't make you feel restrict. Serving both set menu and a la carte menu during lunch and dinner, a meal at Bacchanalia won't broke your wallet. Lunch set is reasonably priced at $48 for 3 dishes, you can get more choices compare to the $75 dinner set for the same amount of dishes. During dinner time, you can also choose the 5 course ($125) and the chef's tasting menu ($65). Vegetarian menu is available upon request in advance. Quite disappointing that bread service was not included in the menu, we ordered it from the a la carte menu since homemade sourdough and carrot butter sounds a great combination. The sourdough has a crunchy crust, but the center was too dry, side with carrot butter infused by Japanese kombu to give it a bit sea flavours, sadly the carrot flavour was underwhelming and the stronger savoury flavour of the Kombu doesn't really work well. Eight dollars for a thick slice dry 'sourdough' that was sliced into two halves - excuse me? The appetizer, cured Hamachi chunks sourced from Japan on top of a rice wafer was appetising. Fresh sashimi works well with crispy wafer, the caviar was not premium quality but added a bit more oceanic flavours to the dish. Not bad. Followed by a warm appetizer of coconut risotto layered with fermented coconut foam, the entire dish was quite aromatic and delicious. 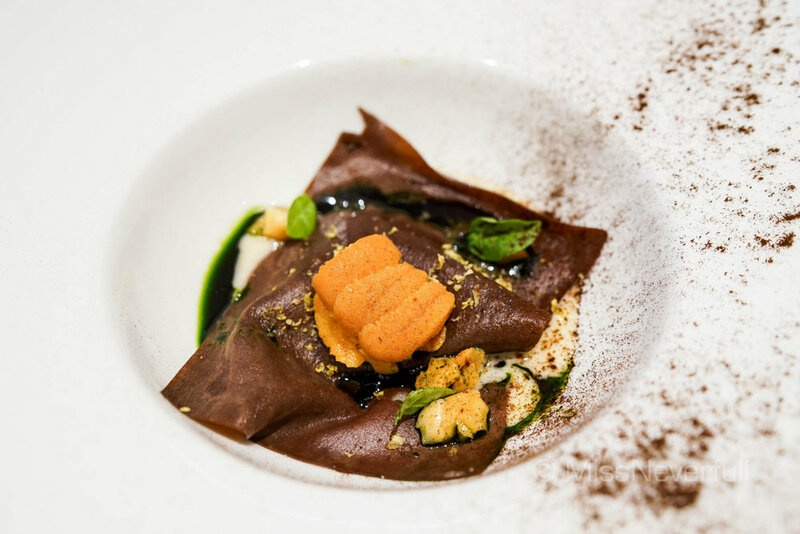 The signature dish at Bacchanalia that we really keen to try was the chocolate pasta with sea urchin. Chocolate pasta sounds really interesting to me, and i was really curious about how it works. A thin layer of homemade buckwheat pasta was laid on top of soft-poached egg yolk, on top of the pasta you will fine fresh Bafun uni from Hokkaido and basil verge. The pasta itself was not al dante like i expected, and itself was underwhelming. The combination of the entire dish was great in texture, rich and creamy but not heavy, while the taste didn't really surprised me. Although Cheek by Jowl's barramundi somehow changed my view to this 'cheap' white fish, i was still a bit worried when i saw barramundi on Bacchanalia's menu. It was a fillet of well-poached barramundi, but it was pretty bland even with the sauce on the side. Two pre-snacks were served before the desserts arrived: mango marshmallow and iced pineapple with chili powder. As a honestly sesame lover, everything sesame-d is quite easy to pass my test. Bacchanalia's famous sesame cake arrived with a beautiful plating which made me mouth-watering. I was a bit disappointing because i expected it to be soft and airy - just like sponge cake, but it was dense like an extra-dense muffin. The sesame flavour was too weak too. The second dessert was a treat from the chef - chocolate tart filled with grapefruit jam, topped with pecan and assam ice cream. This same cute tart was surprisingly good - a crispy tart base and an oozing filling, with a balanced flavour of bitterness and sweetness, probably the only item to be remembered throughout the meal. Although i am a pure fan of Namae-san of L'effervescence, i am not sure whether i will eat at Bacchanalia at a higher price even when Namae-san come for a collaboration in the future.